(Section Headings): Introduction. Mastigomycotina. Zygomycotina. Ascomycotina (ascomycetes). Deuteromycotina (fungi imperfecti). Basidiomycotina (basidiomycetes). Hemibasidiomycetes: Uredinales (rusts). Hemibasidiomycetes: Ustilaginales (smuts). Hymenomycetes. 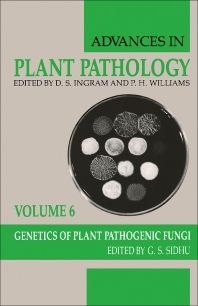 Advances in Plant Pathology, Volume 6: Genetics of Plant Pathogenic Fungi provides information pertinent to the fundamental aspects of plant pathology. This book discusses the trends in plant pathology towards genetic and molecular genetic analysis of the factors determining host–pathogen interaction. Organized into 37 chapters, this volume begins with an overview of the potential of recombinant DNA technology in genetical plant pathology. This text then examines the basic features of sexual and asexual phases of oosporic fungi. Other chapters consider the taxonomy, epidemiology, genetics, and physiology of the downy mildews that includes a crop-by-crop consideration. This book discusses as well the vesicular-arbuscular mycorrhizal fungi and their potential to increase plant production in soils having inadequate mineral nutrients such as zinc and phosphorus. The final chapter deals with the importance of the genus Typhula that contains both parasites and saprophytes. This book is a valuable resource for plant pathologists, students, teachers, and research scientists. Plant pathologists, agronomists, botanists, and plant scientists.